While in other pages the future of Tablet PCs is discussed We will announce the availability of one of the new many Tablet PC that has been released this year: The Viliv S10 Blade. The viliv S10, weighing a mere 2.67 lb (1.21kg), is an unparalleled tool for mobile productivity, featuring integrated 3G (optional), and a swivel, multi-touch screen. It runs Windows 7 seamlessly, while boasting a 10-hour battery life, thanks to its Intel Atom 1.6GHz (2.0GHz max) CPU and solid-state drive. And, let’s face it: design matters and the S10 has sleek, enviable industrial design worthy of its capabilities. The reality is one, Windows 7 came to give the TabletPC a new air. AppCon 2010 is a Conference and Expo about and for Mobile Application Developers. A good opportunity to know what's going on in this field and if you are a developer then let others know about you and your applications. Las Vegas—Mobile App developers from around the world will hit the Las Vegas strip this summer to learn, network and strut their stuff when APPCON™ 2010, the world’s only App-centric event for independent and enterprise mobile App developers, kicks off Tuesday, August 24 at the Paris Hotel in Las Vegas. Bringing together best-in-breed mobile industry leaders, APPCON™ is the primary forum where developers, device and accessory manufacturers and carriers share ideas and influence the future of the mobile App industry. APPCON™ is all about mobile Apps, all the time, and is the only vendor-neutral forum for mobile developers on all platforms. The event runs three days, August 24-26, and is produced jointly by ConvExx and Taptopia, Inc.
APPCON™ showcases the most eclectic collection of developers and world-class manufacturers and carriers during the Expo. The Expo features a full 8 hours of uninterrupted exhibit time that allows demonstrators to show off their Apps, tools and platform innovations without having to compete with concurrent sessions. The APPCON™ Expo will also feature an exclusive Indie Alley, a prominent and dedicated showcase for small, independent App developers to show off their cutting-edge creations to some of the biggest names in mobile Apps, platforms and brand marketing. APPCON™ features more than 40 educational sessions covering the most relevant issues in the industry. A developer-focused track hones in on practical and technical development aspects of creating mobile Apps. A corporate IT track provides insight and expertise on how to manage mobile devices and Applications in the enterprise IT environment. The business track is aimed at App entrepreneurs and startups and covers topics on funding, intellectual property, promotion and other business-driven issues related to the App industry. A pre-conference Hello World session is designed to help attendees get up to speed quickly on App technology before the technical sessions begin in earnest. Part training, part hands-on coding exercise, the Hello World session provides a crash course to get attendees armed and ready for the rest of the event. “Hello World is perfect for experienced developers new to mobile App coding or for a developer experienced in one App platform looking to take a deep dive at the conference on another platform,” said Bryan Scott, CEO of Taptopia, a global provider of mobile technology solutions for event organizers, convention centers and their related vendors. Half social event, half App showcase, the APPCON™ Fast Pitch marries business with pleasure, featuring cocktails, dinner and as many six-minute App demos as possible in one evening. APPCON™ will be partnering with one of the world’s most innovative robotics companies to produce Hackathon, an ongoing contest that pits developer teams against one another in a battle for App supremacy. Participants will be able to get their hands on the latest robotic gear and have a chance to win prizes for their coding prowess. Attending or exhibiting at APPCON™ is inexpensive, with all-inclusive packages covering booth space, setup and conference registration fees for one set price. Rooms at the Paris Hotel start at just $69 a night, and rooms at the connecting Bally’s Resort start at just $49. For more information about APPCON™ 2010, visit www.appconlv.com or follow us on twitter @appconlv http://twitter.com/appconlv. ConvExx, an independent show management company is headquartered in Las Vegas, NV and has produced shows all over the US and around the world. ConvExx produces tradeshows and conferences, as well as consumer events, including the Trade Show 200 Top 10 show – The SEMA Show, and the Las Vegas BikeFest®. For more information about ConvExx and all its services, please visit www.ConvExx.com or call 702-450-7662, ext. 102. Taptopia, a provider of mobile technology solutions, is headquartered in Dallas, TX and provides its solutions to event organizers, convention centers, and their related vendors. The company's solutions encompass leading and proven software and hardware technologies for today's most popular mobile platforms. Taptopia's team is comprised of serial entrepreneurs and technology evangelists who have been innovating and building mobile technology solutions for consumers and enterprise markets for at least a decade. For more information about Taptopia and all of its services, please visit www.Taptopia.com or call 972-479-8822. Taptopia is a wholly owned subsidiary of Metiscan, Inc. (MTIZ.PK). Using apps during a call? There is an Apple TV Advertisement that shots how in an iPhone you can run an application while you are using the phone in a call. At the end AT&T asks: Can you phone do that? If you have an Android phone with T-Mobile, then the answer is yes. All you have to do is hit the home button while in the middle of a call. The call will be sent to the notification bar and allow the user to access any application. Since T-Mobile uses the same GSM technology as AT&T, it can handle voice and data at the same time. Android 2.2 is coming and it's bringing new features currently hidden in Google's Nexus One. Multicolor trackball notifications are definitely coming. Android hackers like ChainsDD have already unlocked this feature for users of custom ROMs. Google advertised the multicolor trackball during its launch of the Nexus One, but the feature was cut from the final Android 2.1 build. When it comes to the FM radio, I have no idea. Other HTC phones on a similar Snapdragon platform (Desire and Incredible) include the FM radio so it’s not out of the question that the N1 has it too. Wow, what are the other secrets left to be discovered in Nexus One? Who knows. That sounds promising. It's not clear what's the battery live in this clone but it got my attention. The Atom N450 at 1.66 GHz is plenty enough to run W7 at a performance that will satisfy 99.9% of the users. 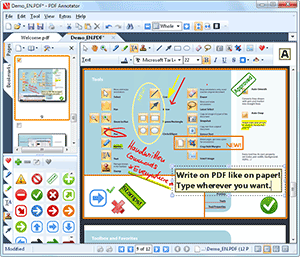 PDF Annotator 3 is Here! PDF Annotator is the kind of tool that should be installed in all Tablet PCs. If you have not tested, do it, and you will know why I'm saying this. This is just a summary of the major news. Read more about the new features and see them illustrated on our What's New website. Fixit Center Online is a new online service from Microsoft. I tested it briefly today and in few minutes it detected and fixed few problems that I even did not know that they existed. Problems with codecs interfering with IE and some IE addons causing issues. Great Tool! Shazam is a “must have” in every Android phone. But I was surprised to see that in my Nexus One the application was not opening Amazon MP3 Store app but Amazon web site where I could not buy anything. After a little bit of research I found that I was not the only one experiencing this issue and that it's Amazon the one blocking other applications from using Amazon MP3 Store app (version 1.6), according to this report. However, it looks like the Nexus One shipped with a newer version of the Amazon MP3 Store app (version 1.6) and this method of linking now results in an exception. Shazam without a direct link to buy the song is almost useless. I hope that this issue is fixed soon. Dan Povenmire is the Executive Producer of Phineas and Ferb, from Disney Channel. But this is not the reason why I'm writing about him but the report from John Hill about Dan using a Motion Tablet PC to create the Storyboards of this show. The lightweight design of the Motion Tablet enables him to carry it wherever he goes. During a recent flight to Taiwan he composed 250 pages of storyboards, something he couldn’t have done before on paper due to the weight and bulk. Also, the tablet PCs portability and easy input with a stylus make drawing and creating in tight spaces easy. “It’s the perfect size for drawing storyboards and animating,” says Povenmire, describing the size and ergonomics of his Motion Tablet. No, he is not Ctitanic. There is somebody worse than me. If you are looking for an external USB HDD to backup your data here is a very good deal, a 500 Gb HDD at 5400 rpm for 70 dollars. Many of the external HDD of this site run at 4200 rpm and that means that the performance is not too good. Perfect for storing and transporting files, the Fantom Drive Titanium Mini Portable USB 2.0 hard drive is the ideal pocket-sized solution for storing and backing up all of your documents, music, videos, and photos. The Fantom Drive Titanium Mini Portable USB 2.0 drive provides transfer rates of up to 60MB/s over USB 2.0 and is backwards compatible with USB 1.1. It's like Tablet PCs are getting a second chance. A new one is coming soon, the Evigroup Paddle 10" TabletPC according to news published at UMPCPortal. The design looks good but I believe that Slates should have few hot keys around the screen to make their use easier. Recently Engadget has published the following comparison tablet reveling for the first time the HP Stale Specifications. Slate will run $549 in its base configuration, which has a 8.9-inch 1024 x 600 capacitive multitouch display, a 1.6GHz Atom Z530 processor with UMA graphics and an accelerator for 1080p video playback (we're assuming it's a Broadcom Crystal HD chip), 32GB of flash storage and 1GB of non-upgradeable RAM. There's also a $599 version with 64GB of storage, and both models will have a five-hour battery, an SDHC slot, two camera, a USB port, a SIM card slot for the optional 3G modem, and a dock connector for power, audio, and HDMI out. The HP State has all the conditions to be a winner. Using W7 gives the Slate the advantage of covering what the iPad can't cover: daily work. Now, the iPad is using a touch friendly and really easy to use OS. Very light and as result the performance is great. The question is, can HP create an UI with a performance good enough to compete against the iPad? I hope so. The second question is boot time. Nobody has said anything about this topic. How HP will fix this issue? A dual boot? More information is needed. The specifications are good, the design is good and the marketing camping behind is good. Oh! and the price is good too! All the ingredients to become a winner. Like in a response to the release to market of the iPad; HP has released a new video that would translate in something like "what I have that you don't have". This and a marketing campaign like I have not seen from HP in a long time could be something that Apple did not see coming. Microsoft has announced a new marketing strategy to increase the sales of Office 2010: giving the Starter version for free. I have been using Office 2010 and I love it. The Beta has been very stable on my PC and once I got used to it I could come back to Office 2007. Hulu has released a desktop software that allows you to play your favorites shows without opening Internet Explorer. Here is a short movie of it running in my Ruvo Mini PC. All around the iPad ends in a lot of money. Let's face it. The iPad is a Multimedia Internet Device. A device to be connected and that comes with 3G only for AT&T users , adding to the already elevated price for the iPad $130 dollars more, no counting the AT&T monthly fees. Do you want a keyboard? $90. A docking station? $30. All these are not included out of the box. So do not be surprised if you end paying around $950 for your "Browsing in your sofa experience". All that for a device that does less than your cheaper laptop or UMPC.